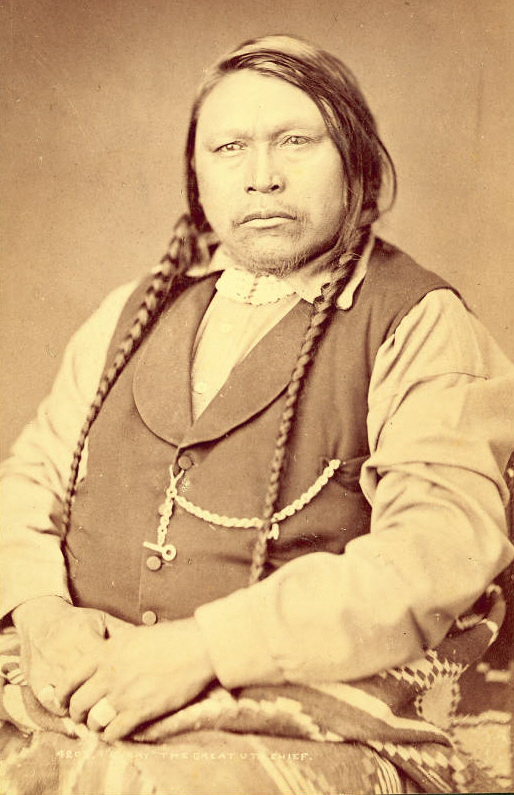 To learn more about Chipeta’s husband, Chief Ouray, read a brief bio on the Denver Public Library blog or the full biography Ouray Chief of the Utes by P. David Smith. 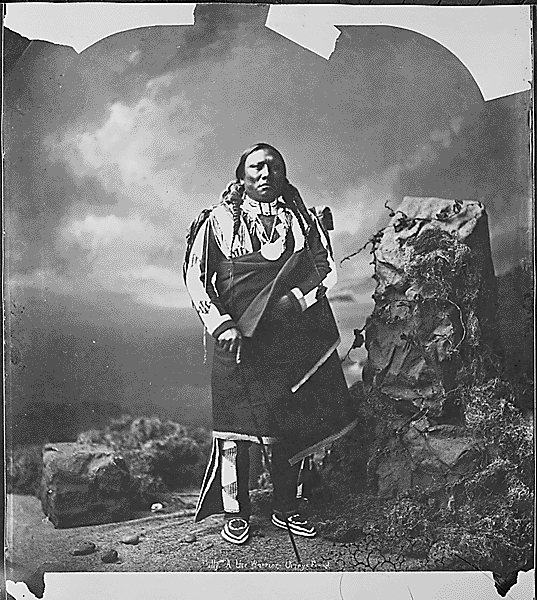 This photo was taken in the 1870s by William Chamberlain in the Denver studio of William Henry Jackson. 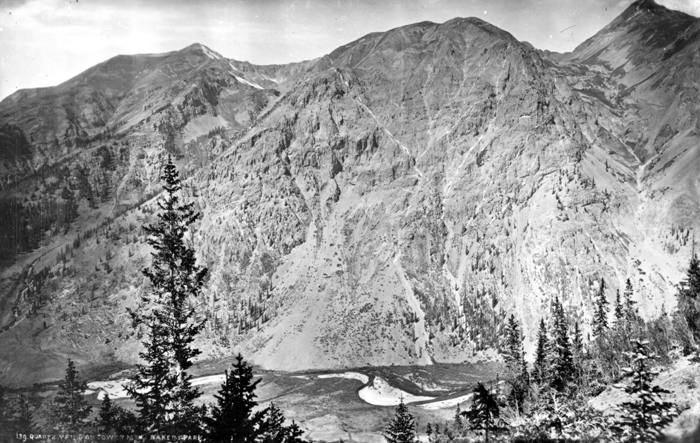 This photo of Ouray was taken about 1863. He holds the ebony cane given to him by President Abraham Lincoln during his first trip to Washington with a delegation of Utes. Ouray also wears the Lincoln Peace Medal which was given to a few chiefs at the conclusion of the 1863 treaty conference held in Colorado. 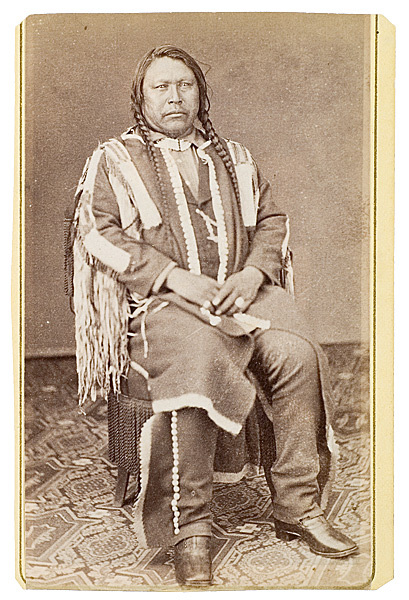 Chipeta made Ouray’s clothing, mocassins, and pipe bag from deer or elk hides and decorated them with trade beads and possibly some natural materials such as seeds or quills. Alfred Packer and party (21 miners) were visitng Ouray’s camp in winter. Ouray advised them to stay with the camp. Ten stayed. Five went on and died near Gunnison cattle camp. Packer was one of six men who left the first of February. Packer alone arrived at the Agency April 16th, apparently in good health. The noises which strike your ear are equally varied, running all the way from the squealing of a poor little papoose strapped in its coffin-like cradle, or the really melodious laughter of a squaw to the hoarse whinnies of a hundred horses and the ringing report of a revolver. The one sound though which will attract your attention, and which you will never fail to hear, is the monotonous droning drama in the medicine man’s tent, generally accompanied by the more monotonous chanting of a series of notes in the minor key which is neither song nor howl nor chant, and which could go on endlessly if it wasn’t occasionally stopped by a yelp from the leader. The young bucks enjoy this singing and swing their bodies in time with a seriousness of countenance that is very funny to a white man. I have seen two different drums among them: one nothing more than buckskin tied tightly over the mouth of a jar, and the other made of raw hide stretched very tense over a broad hoop, so that the shape was that of a sieve. Photo courtesy the U.S. Geological Survey Photographic Library with desciption as written by a Hayden photographer. A VISIT TO A TRIBE OF UTES. Part of a Ute camp at Los Pinos with sheep and goats grazing in foreground. 1874. 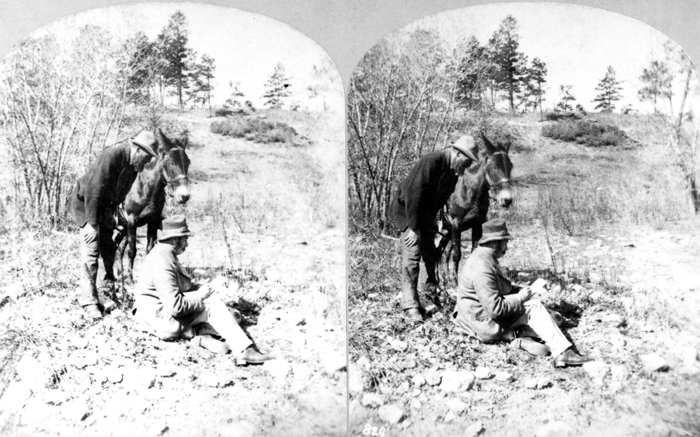 William Henry Jackson (cropped from a stereograph). 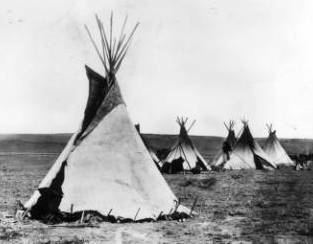 …there are often 80 or 90 lodges [teepees] in each camp. These lodges are all nowadays made of cotton cloth furnished by the Government, are conical in form, supported on several slender poles meeting at the top, where the cloth is so disposed as to make a sort of flap or guard, set by the wind in order to cause a proper draught. A little low opening in one side makes a door which is usually closed by a flap of hide or an old blanket. 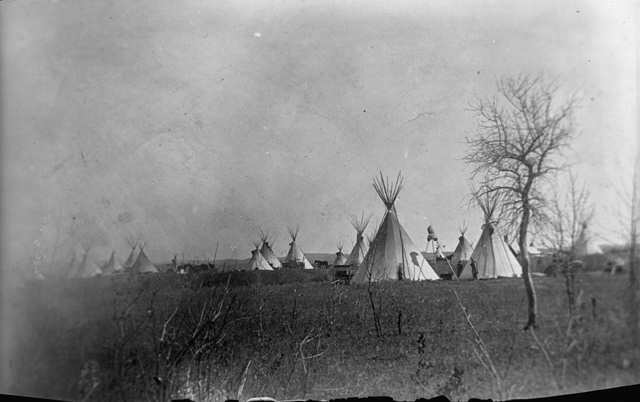 Teepees in background show effects of smoke on canvas. 1874. William Henry Jackson (cropped from larger photo). The white cloth soon becomes begrimed with smoke at the top, which in time extends downward and deepens, until you have a perfect gradation of color from the white base through ever deepening smoke browns to the sooty blackness of the apex, adding greatly to their beauty. Besides this coloration, for which their owners are not directly responsible, the lodges are often painted in bright colors, particularly about the doorways, and in a band around the base; and usually there will be one or two yellow, or blue, or striped lodges in a camp, giving a picturesque variety to the scene. [P]onies stroll and entangle long lariats of braided raw-hide, dogs bark, and indifferent warriors in gay suits smoke with stoical laziness. This article was written by an unidentified member of the Hayden Survey team based on his observations and an August 27, 1874 interview with Ouray. Photo courtesy the U.S. Geological Survey. Ouray by William Henry Jackson taken at Los Pinos 1874. [After obtaining horses, the Utes] changed their attitude of defense to one of offense and used the war hotly against their old enemies, refusing to fight the Spaniards, as nearly all of the village tribes south of these were doing. It was in these raids that they first obtained and learned to use fire arms, capturing them from the plains Indians who had been visited by traders. Gaining in strength, numbers and courage with new victories through long years and weary battles, they finally drove them east of the Rocky Mountains, actually on to the plains, and were possessors of all the territory now included in Utah and Colorado, between the Wahsatch Mountains and the main range. Of course, it is difficult to tell how long ago all this happened; but that the main account is a true history of the tribe I have little doubt. The rest we can form a definite idea of, for Ouray tells me that he can remember when the Utes first met the white man (that is, Americans…) in the vicinity of Del Norte on the Rio Grande. His father, Salvador, was then chief of the tribe and his mother an Apache. These white men were of course traders, but they were soon followed by others and the Utes soon became familiar and friendly with them…[I]t is their boast today that no Ute in good standing has ever killed a white man. The head men of the tribe are constantly watching the behavior of the boys and young men. When they see one who is intelligent and progressive, whose ideas are in conformity with the policy of the [Ute] nation, and who shows a capacity for carrying on their affairs with credit and advantage, he is looked upon as a captain without further ceremony. From the captains the head chief is elected. Young and powerful Ouray in 1863. He holds the cane presented to him by President Abraham Lincoln. Such a man was young Ouray, and he at last became chief, with the consent of the tribe, altogether through his own merits, and not because his father was chief, for no hereditary honors are recognized. He first succeeded Benito as war chief in 1863, perhaps at the nomination and certainly with the sanction of the U.S. Government, which had become convinced of his ability during negotiation of the treaty at that time. The election and the terms of the treaty together so dissatisfied old Nevava, head chief, that with all his band he left the Southern Utes and reported thereafter at the White River Agency. Subsequently there was a split in his band, and some 350 went, under the leadership of Piah, to Denver, where they now receive their supplies. 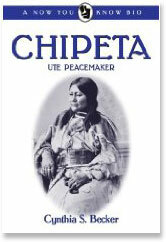 Photos courtesy Denver Public Library, Western History Collection. 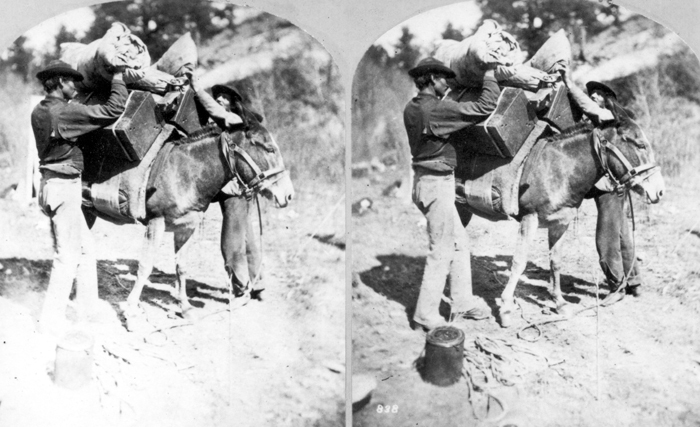 Members of the Hayden Survey team load a pack mule. 1874. After the advent of the Spaniards, who introduced metals, the use of stone weapons and implements gradually declined, until now none whatever are used by the tribe. Having only bows and arrows, no horses or dogs, and yet trusting to the chase for their maintenance, they acquired all their wild game by driving it into ambush…They had at this primitive time no goats, sheep, or cattle, nor was there any current means of exchange, any legal tender or money, unless the buckskin in which the medicine men… received their pay, might be called such. 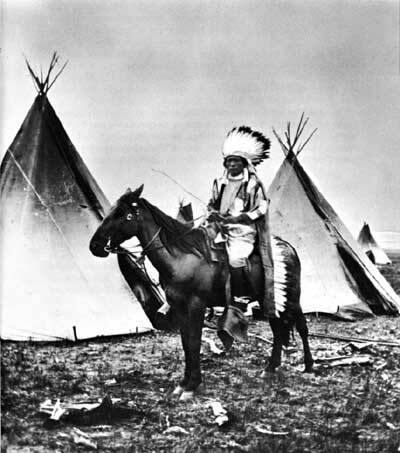 Their only enemies at this time were the plains Indians and some mountain tribes to the north of them. From these they were constantly obliged to defend themselves, but they made few aggressive raids beyond their own narrow limits. South of them were the Jicarilla Apaches, with whom they were always on friendly terms, and even intermarried, but curiously enough, it was always an Apache girl marrying a Ute, and never a young Ute girl giving her hand to an Apache brave. There was no law about it—only usage had contained the custom. Through these [Jicarilla Apaches] the Utes communicated with the Spaniards, who had already settled south and west of there, in what is now Eastern Arizona, and from them obtained a few horses and dogs, which by being carefully bred soon multiplied until they had accumulated sufficient stock. This was the first step toward their subsequent prosperity. 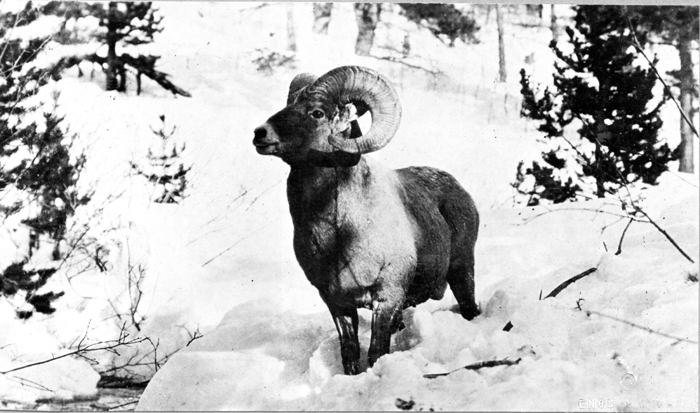 Photo by William Henry Jackson courtesy the U.S. Geological Survey Photographic Library.